Mercedes builds the CLA, shown, and B-class models in Hungary. 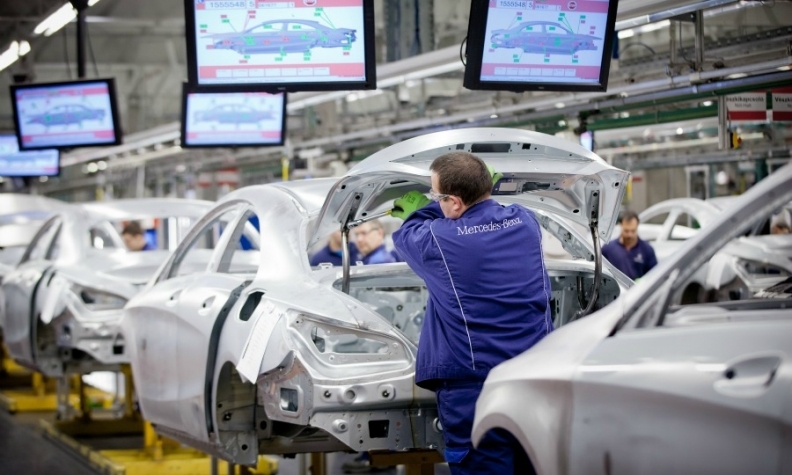 BUDAPEST -- Mercedes' plant in Kecskemet, Hungary, was hit by a two-hour strike on Wednesday involving 80 workers demanding higher wages and threatening a further walk-out if a deal is not agreed. The automaker said production was going on as scheduled despite the disruption. Mercedes builds its B class and CLA compact cars in Hungary, according to the Automotive News Europe plant assembly map. Bela Balogh, president of the Vasas trade union said the workers went on strike in the assembly hall, delaying the shipment of 50 cars. "We also want the [production] targets to be met as we trust that we can agree on the wage increase," he told Reuters. "[But] the strike committee continues to work and we are ready to go on strike again if needed," he added. Vasas, the biggest trade union at the plant and in the Hungarian automotive industry, wants a 15 percent wage increase for 2017 and rejected a wage deal reached by the company with a smaller union, Balogh said. "That agreement was premature," he said, adding that a national deal on wages struck by the government and employers on Tuesday opened further room for Mercedes, on top of its earnings and business outlook, to increase wages. The deal includes cuts in corporate and payroll taxes and the government said employers should boost wages in return, to help reverse a flight of labor into richer EU members. "We are likely to see wage hike claims across the entire automotive sector," Balogh said. Mercedes employs about 4,000 people in the country and produced 180,000 cars last year, making it the country's fourth-biggest exporter. The unit posted 66 million euros in after-tax profits in 2015. Other companies in Hungary's automotive industry include Audi and Suzuki. The sector accounted for more than a quarter of Hungary's total industrial output last year. The production and exports of cars, run by foreign owners, is a key driver of economic growth in the eastern European Union member where wages for skilled workers are well below Western European levels.